The harvest is slowly moving northwards. In the US, California is closing the season to make way for the north western states. In Europe, there is an overlap between the south and the north. Due to good weather in the north, the harvest has started early, while in the south the weather has not been as favourable. In Spain, the harvest was unexpectedly larger, so great volumes have been available late in the season. In general, however, the mood is positive, especially in France, where the fruit is linked to the national football team (Les Blues), which will be playing in the coming weeks in Russia. The dust hasn't fully settled in the southern hemisphere. Although the season there has come to an end, Latin American countries are opening up new markets, with China being especially attractive. Also, part of the Chilean sector is concerned about the quality of the berries and the impact this may have on the country's competitiveness. The first blueberries became available this week. The prices vary widely and range from 130 to 200 UAH (4.43-6.51 Euro) per kilo, depending on the size. According to the growers, drought is the biggest challenge this season. The lack of moisture cannot be completely compensated for by drip irrigation, which means that sizes are smaller this year. At the same time, growers expect a larger production, especially because of the entry into production of new plantings. From July, the supply of Ukrainian blueberries will grow further. The harvest this year will not be as great as growers had hoped. The revenue, however, is expected to be in line with last year's. This drop in the production is the result of frosts earlier this year. "We knew there would be losses, but many growers were hoping for a good season, because the frost hit early in the year," says a grower. The extent of the losses will depend on the variety. A grower says that some varieties may suffer losses of up to 50%, but in his own plantation, he expects between 20 and 25% of the production to be lost. The total extent of the damage is still unclear. Besides the frost, the warm weather was also a hurdle. Thus, it is difficult to give an accurate prediction about the production, since many different trees and shrubs were in bloom at the same time. Nevertheless, the prospects for the season are good. Over the last two years, work has been done on promotions in Poland, as a result of which the market is growing. "There are 40 million people living in Poland. It's a big market, so why not take these opportunities?" asks a trader. Moreover, there are exports going to several destinations, including the United Kingdom, Germany and Scandinavia. Markets further away, in Asia or the Middle East, are also taken into consideration, but the opportunities there depend strongly on the global market situation. The supply of German blueberries is going smoothly due to the warm weather. However, the high temperatures have also resulted in an early start of the domestic blackberry, red berry and gooseberry seasons. Whether this will take a toll on the demand for blueberries is still difficult to say at this time and will only become clear in the next two weeks. However, the supply of blueberries in northern Germany (Lüneburg Heide) is still a few weeks late. Regional producers expect to start the harvest in the second half of July. Traders confirm that they have had a reasonable import season so far, although the sharp temperature fluctuations in Spain caused some instability in the volumes and quality available. As far as domestic production is concerned, competition from the neighbouring countries is fierce. The noteworthy expansion of the acreage in the Netherlands and Poland is clearly keeping German specialists busy. It is therefore hoped that the current blueberry hype will be toned down slightly and that the acreage will be reduced again in the long term. In any case, German blueberries have a good reputation because of their good quality and mostly organic production processes. Denmark and other Scandinavian countries, among others, are major sales markets for (North-) German blueberries, as highlighted by various traders. "Allez les Blues" will certainly be sung this World Cup by many French people, and if it is up to the sector to then fill those mouths with blueberries. "The season in France has kicked off this year coinciding with the start of the World Cup," says a trader enthusiastically. He set up a promotion selling the berries under the slogan "Allez les Blues". The berries are sold in packs ranging from 100 to 500 grams. The season has just begun. In order to hit the market both in the north and in the south, and anticipating the commercial potential of a longer season, the fruit is cultivated both in the north and the south of the country. "Given the start, I expect a normal season," says a trader. However, there is room for growth, as new plantings are coming into production. A trader says that, for now, they expect the demand to continue rising. He sees changes in customer demands when it comes to packaging, with a switch from portion packs to family packs. At the moment, there is only Italian production available at a price of 12-12.50 Euro in Verona and Torina. In Rome, the berries cost 17 Euro. Due to the mild temperatures, abundant rainfall and cloudy days, the Spanish season underwent a period with a low yield. That period has given way to another with surplus productions, which has resulted in difficult market conditions. The unstable weather this year has taken a toll on all soft fruits. "Although the blueberry season in general has been good, the harvest has been slowed down considerably and we still have remarkable volumes available," says a trader. This situation couldn't be predicted and that has made the fruit's marketing more challenging. "We thought we had already left the peak behind, but then larger volumes than expected became suddenly available," says a trader. This has coincided with an early start in northern Europe and the beginning of the summer fruit campaign, so there is more competition. Thanks to the high demand, the market has not completely collapsed this year. Traders are also trying to work with more distant export destinations. A large exporter managed to triple its shipments to South East Asia. 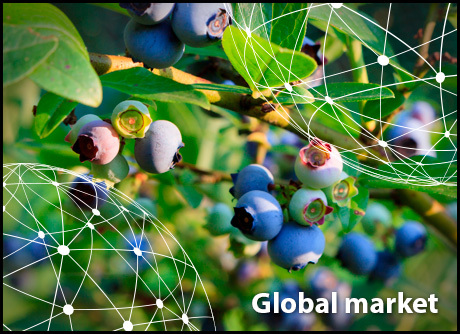 Because of the bad weather in southern Europe and the good weather in northern Europe, many berries are coming onto the market at the same time. Importers say that the supply from Morocco will probably come to an end this week. The same applies to Spain, although those stocks are more difficult to estimate due to the supply in controlled-atmosphere refrigeration. However, the quality of Spanish berries is declining rapidly, which results in falling prices and blueberries offered for sale at any price. Meanwhile, the Serbian season has also started with a good quality product, but a hailstorm has destroyed a lot of production there. A 25% drop in the total volume is expected. Next week, Portugal will go into full production. The prices of the Portuguese berries amount to around 4.50-5 Euro. Poland will also start harvesting next week in the south, but the volumes will still be limited in the first two weeks. The Netherlands will also be harvesting at the end of next week, and due to the large plantings of the early variety Duke, the Dutch supply is expected to reach a high level soon. Traders report that the demand for berries has been good, with many promotional campaigns at supermarkets and smooth sales. The peak in the supply seems to coincide more and more with the southern season. From September, lower volumes are expected in Europe, which in turn paves the way for products from South America and South Africa. The share of organic blueberries has grown very quickly in Belgium in recent years. The total consumption of blueberries is on the rise, and the share of the organic is growing at a similar pace. There is a price gap of about 20% between bio and conventional blueberries. This higher price is partly due to the lower yield per hectare of the organic berries. The consumption of blueberries in Belgium has become popular thanks to Albert Heijn's promotions, carried out via Delhaize. The largest buyers of blueberries in Belgium (conventional and organic) are retailers, with 80 to 85%. Many conventional supermarkets also feature the organic berries in their range. California is preparing for the end of the season, after which the harvest shifts to other states in the US. There is currently sufficient supply, according to a trader. The season is shifting from California to the northwest of the US. "The harvest in California was not as big as expected this year. We suffered frosts in March and these had a big impact." The season will gradually come to an end in the coming weeks. "Hot weather has been forecast and heat and blueberries don't mix well, so the campaign will likely finish quickly," says a grower. For growers in Georgia and North and South Carolina, it has been a good season. A trader explains that there were no surpluses, so the market has stayed in good balance. Over the past 15 to 20 years, the demand has grown explosively, but traders now expect this growth to slow down. With the end of the season in California, the price is also on a falling trend. The best prices are usually obtained shortly after the campaign kicks off. As the volume increases during the season, the price falls. The Ñuble region is considered a potential growing area for blueberries to be exported to the US without restrictions. The US had introduced restrictions due to the detection of Lobesia botrana in the O'Higgins, Maule and Bio Bio regions. A technical solution was found, consisting in the fumigation of the berries, but this wasn't possible for organic growers and the US border remained closed for them. The Blueberry Committee announced that exports stood at 110,000 tonnes, which is a record volume. The Bio Bio region accounted for 32% of that volume. Within the Chilean sector, concerns have been expressed about the quality of the blueberries. According to some traders, quality has declined over the past three seasons and this has had an impact on Chile's position on the world market. Growers are affected by a number of factors, including poorly maintained plantations, inadequate varieties, challenging climate conditions and more extreme weather. The quality of the berries from other countries, such as Morocco, Peru, Mexico and South Africa, has improved, and according to the concerned traders, Chile is lagging behind. They believe that switching to other varieties will be insufficient; more steps must be taken to ensure that the chain is better organised. According to the exporters' association, exports in the first quarter of this year were worth over 48 million dollars; an increase of 229% over the same period a year earlier. The figures also show that the US is the most important market, accounting for a turnover of almost 32 million dollars. Next in the ranking are the Netherlands, the United Kingdom, Canada, China and thirteen smaller markets. Since the opening of the Chinese market in 2016, exports to this destination have grown explosively. Between January and March, 1,226.7% more blueberries were shipped to China than in the same period a year earlier. In September, the first shipment of Argentinian blueberries will go to China. The South American country officially gained access to this huge market in December 2017. A total of twenty companies have been selected to export there. The trade association also wants to organise a promotional campaign in China. Thailand also opened its borders to Argentinian blueberries. With this new market, Argentina hopes to increase its sales to the Far East. According to the authorities, Argentina has gained access to 120 new markets over the past two years. For export to Thailand, only a phytosanitary certificate (with accompanying documents) is required. 18,000 tonnes of blueberries are expected to be harvested this year. In May, the authorities in Uruguay reported that an agreement had been reached with China to allow domestic blueberries access to that market. The Uruguayan sector hopes to build a relationship with Chinese companies. "The agreement has been signed; now we only have to make it happen," said the Uruguayan minister in May. Blueberries are usually in season during the summer and autumn, but thanks to cultivation in the north, it is possible to have domestic production on the market all year round. Last year, the production grew by 25% and stood at 9,553 tonnes worth $ 193.6 million. It was a good year in terms of demand, not only in the domestic market, but also in exports. 356 tonnes were exported, generating 8.2 million dollars (+62%). Almost half (47%) of the exports are intended for Hong Kong. Exports are expected to increase further in the coming years, as the government is working on gaining access to new markets. Imports fell by 15% compared to the previous year. The largest supplier is New Zealand. The heat in New Zealand resulted in an early start of the summer season, so there was a larger volume than expected on the market. The sunny weather had a positive impact; the sugar content rose and the quality improved. Chinese consumption continues to rise and prospects remain great. Driscoll's China recently predicted that the Chinese soft fruit market could outpace the US. To meet this growing demand, investments were made five years ago to give a boost to cultivation in China. Imports are growing every year. In the first months of this year, blueberries were supplied by Peru, Chile and Mexico. Argentina has now also gained access. The demand is on the rise and domestic cultivation is also expanding. This season, production has been sufficient to meet the demand. The season in the south east has just been completed. The long distances in the country are still a challenge for the growers, since the demand is especially good for blueberries with a high Brix.